A small Massachusetts town has rejected an offer from Comcast and instead plans to build a municipal fiber broadband network. About 160 residents voted, with 56 percent rejecting the Comcast offer, according to news reports. An increase in property taxes would cover the construction cost. But the town would also bring in revenue from selling broadband service and potentially break even, making the project less expensive than Comcast’s offer. Currently, Comcast covers about 9.5 percent of Charlemont, while Verizon DSL is available in about 88 percent, according to estimates by BroadbandNow. The town plans to charge $79 a month for standalone Internet service with gigabit download and upload speeds and no data caps, though the price could rise to $99 a month if fewer than 40 percent of households buy the service. The town also plans to offer phone and TV service at rates cheaper than Comcast’s. A document distributed to town meeting voters listed the estimated prices as well as pros and cons for both the Comcast proposal and the municipal fiber option. Charlemont is one of about 20 small towns in western Massachusetts that are working on broadband plans with Westfield Gas & Electric. Charlemont also received a $960,000 stage grant to design the municipal network. Leading up to the special town meeting, the town Broadband Committee opposed the Comcast offer while the town Finance Committee supported the Comcast offer. But town meeting voters had the final say. “The fiber network project has been on hold for the last several months, awaiting a town vote on the Comcast proposal,” Handsaker said. 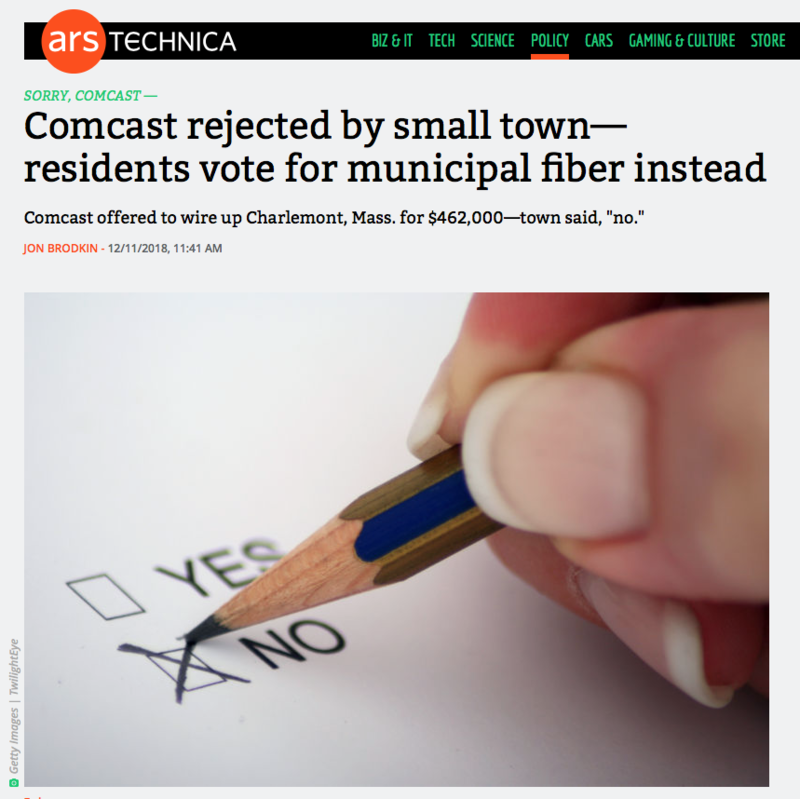 In a win for Municipal Internet/Net Neutrality, Charlemont, MA rejects Comcast and is going to build their own internet infrastructure instead. Thanks to TB for sharing this story with us @ Z5G!